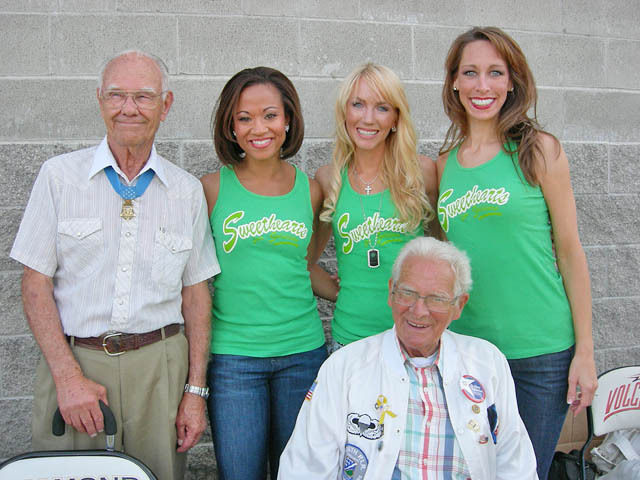 Sweethearts for Soldiers had a big 4th of July weekend earlier this month. Sweethearts Brianne, Natalie, and Jill traveled to Oregon for this trip. Some of you will recognize these ladies. Brianne is a rookie Tennessee Titans Cheerleader. Prior to this, she was a San Diego Charger Girl. Natalie is a former Baltimore Ravens Cheerleaders, and Jill is a retired member of the ROAR of the Jaguars. The Sweethearts are a group of current and former NFL cheerleaders who were involved in visiting and supporting our military during their time on the squad, and wanted to continue those activities beyond the team’s commitments. You can learn all about their efforts at SweetheartsforSoldiers.org. Make sure to visit, especially if you are interested in becoming a Sweetheart yourself! I, along with two other Sweethearts for Soldiers, just had the most memorable 4th of July weekend. It all started with Jill, Natalie and me taking 5 hour flights across the country to the small, but significant, town of Keizer, Or. Keizer is especially significant to me because I was born and raised there. On the morning of July 3rd, we made an appearance on the Terry Sol show, which can be heard locally on KBZY radio station. We then attended our first event at McNary Golf Course’s “Prime Steak and Seafood” restaurant, where the community came together to raise money for the Fallen Soldiers’ fund. I had a great time entertaining the guests on the back veranda, with my country music. 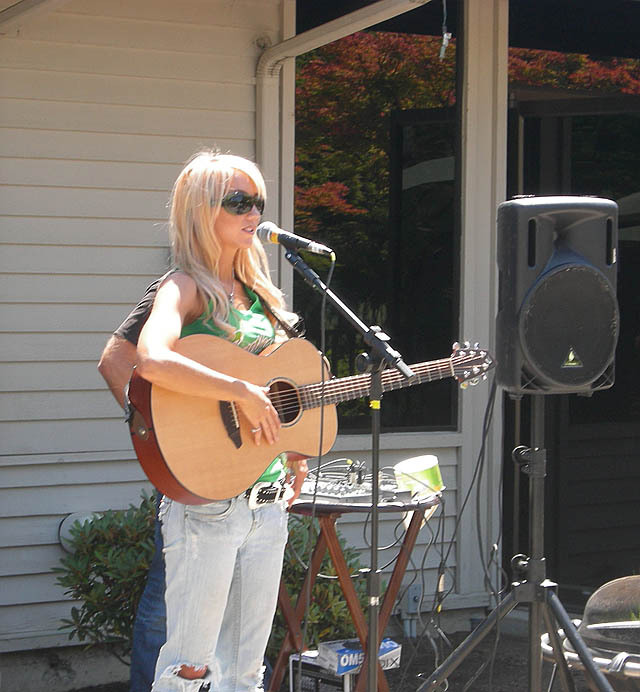 After running a rehearsal at The Courthouse Athletic Club, we made an appearance at Keizer’s hottest new restaurant/bar, On the Rocs, where I again held a concert to entertain the guests. We signed autographed Sweetheart calendars and promoted our 4th of July event to be held the next day. 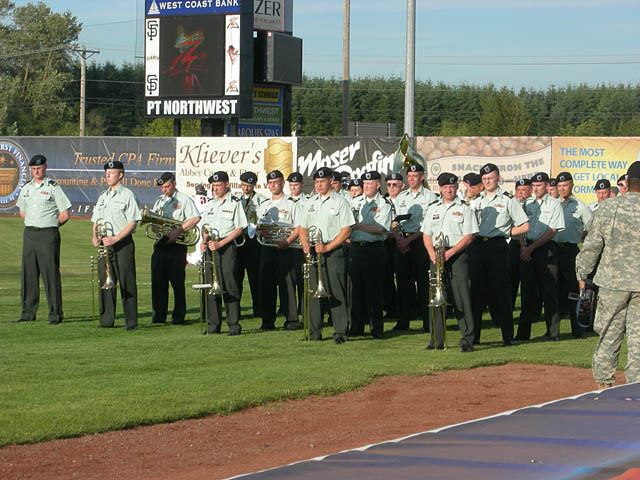 On July 4th my fellow Sweethearts and I went to Volcanoes Stadium where nearly 5,000 people were waiting for a night of country music, baseball, performances by The Sweethearts for Soldiers and the 234th National Guard Army Band, and appearances by very special war heroes. The evening began with my pre-game concert which was very well attended. Afterwards, the opening ceremonies were outstanding. I was then honored to throw the first ceremonial pitch along with Oregon’s only living Congressional Medal of Honor winner from World War II, Robert Maxwell, and the featured soldier from the tv mini-series, “Band of Brothers”, Don Malarkey. As the two WWII heroes were introduced, the crowd of 4,826 gave them a 2-3 minute standing ovation. The 234th Army Band played the National Anthem, and then God Bless America in the 7th inning. The 6th Marines also presented the colors. During the 4th inning, we brought three soldiers, who had just returned home from Iraq, onto the field, introduced them, which prompted another rousing round of applause. The Sweethearts danced during the middle of the 3rd and 6th innings, and did a fabulous job. We also had a table on the main concourse, signed autographs, took a lot of pictures with Volcanoes fans, and sold our Sweetheart calendars. During the 8th inning, we visited everyone in all of the Sky box Suites, and took pictures with them as well. As soon as the game was over, and before the Fireworks began, I was honored to sing my new song, “Parades”. 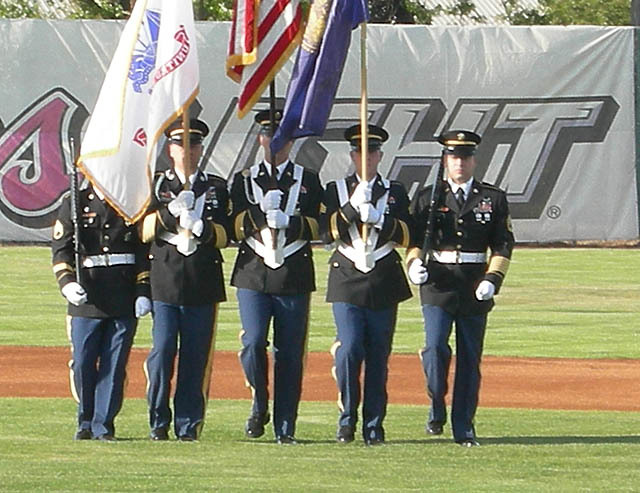 This is a song dedicated to the troops, which I sang from home plate to several thousand fans. It was a very emotional moment that I will never forget! After my song, the Army Band played patriotic songs during the entire Fireworks show. What a way to end a perfect night which reminded us all WHY we celebrate July 4th. Let Freedom Ring!!!! God bless all our soldiers and God bless the USA! You can find my original song for the troops, “Parades” on iTunes and on MySpace under Brianne Marie Beaty. And don’t forget to go to www.SweetheartsForSoldiers.com to buy our 2009 calendar and support our non-profit military outreach organization!